Israeli soldiers fired, on Thursday at dawn, several missiles into areas, northwest of Gaza city, Khan Younis and central Gaza, while navy ships also fired missiles into northern Gaza, in addition to attacking fishing boats in Khan Younis. Update: Media sources in Gaza said the Israeli Air Force carried out at least ten strikes, targeting several areas in the besieged coastal region, causing property damage, to building and homes. The strikes targeted Tal al-Hawa neighborhood, southwest of Gaza city, destroying s site used by an armed resistance group, in addition to causing damage to several homes in the area. The soldiers also fired missiles into the Zeitoun neighborhood, southeast of Gaza City, causing damage to homes and structures. Media sources in Gaza said Israeli war jets fired many missiles into an area, northwest of Gaza city, causing damage and fire to several buildings. They added that the soldiers also fired missiles and shells, south of the Zeitoun neighborhood, in Gaza city, in addition to an area near the shore in Deir al-Balah, in central Gaza. The soldiers also fired missiles into an area, west of the Nusseirat refugee camp, in Central Gaza, in addition to another area, west of Khan Younis, in the southern part of the coastal region. The Israeli missiles led to excessive property damage in the bombarded areas, but did not lead to casualties. In related news, Israeli navy ships fired missiles into the al-Waha area, in northern Gaza, causing damage. Navy ships also sailed close to the shore in Khan Younis, and forced the Palestinian fishermen away, by firing many live rounds at their boats. 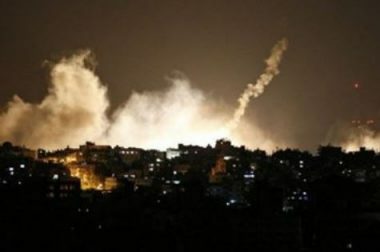 The attacks were accompanied by heavy deployment of army drones, and helicopters, over various parts of the Gaza Strip.